– Coverage is terrible. We did not get the 30 sq. feet per gallon for the 2 coats. Closer to 20 sq. feet for two coats. We spent over $350 for our 200 sq. foot deck. 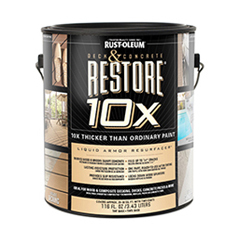 – The Rust-Oleum Rock Solid Deck Coating does not darken in color. – Be prepared to power sand this off for switching to a different brand. If rotting occurs, you may need to replace the decking. Cost: $40 for a 1 Gallon. 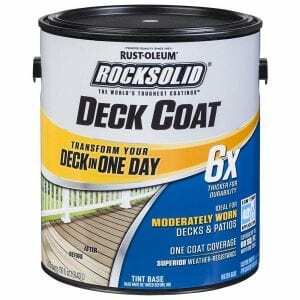 Deck Start Wood Primer must be used first.